Back in March of 2012 I posted the build components for my ESXi 5.0 home lab server. Since we’re coming up on 2 years from that point, and there’s all sorts of crazy holiday shopping deals going on, I figured it was time for a refresh. Without further ado, here is a look at the new build components for an ESXi 5.5 home lab server. Many folks have had an eyeball on the new 4th gen Haswell chips, which is the latest Tock release for Intel in the 22nm fabrication process (Broadwell, the next Tick, is coming shortly). Haswell requires a motherboard with the LGA 1150 socket (also referred to as Socket H3) and offers a decent number of performance bumps over the Sandy Bridge and Ivy Bridge chips. 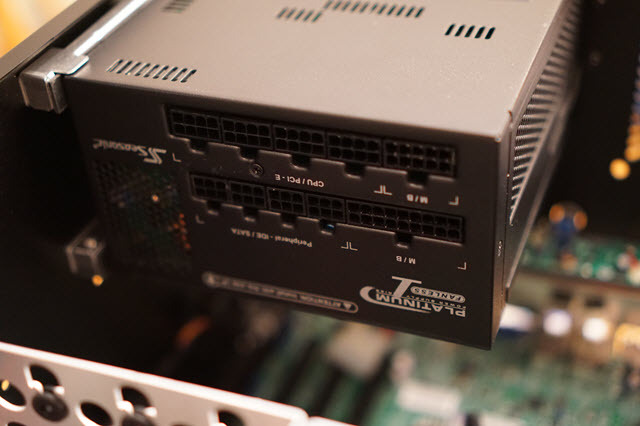 There are two quad core options available for your home lab server – with Hyper Threading or without. 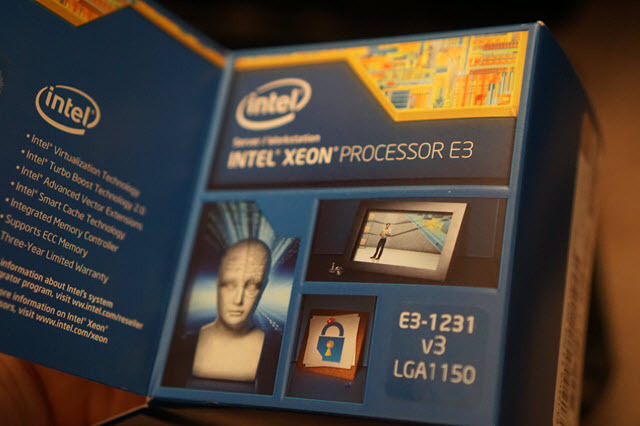 The Xeon E3-1220v3 runs a straight 4 cores and 4 threads, while the Xeon E3-v1230v3 runs 4 cores and 8 threads. Both are similar in almost all other respects (the 1230 has a slightly faster clock) and include support for the entire range of advanced technologies – vPro, VT-x, VT-d, EPT, TET, etc. I’d personally go with the 1230 or better, but I realize that many folks do not need Hyper Threading and want to save a few bucks with the 1220 option. 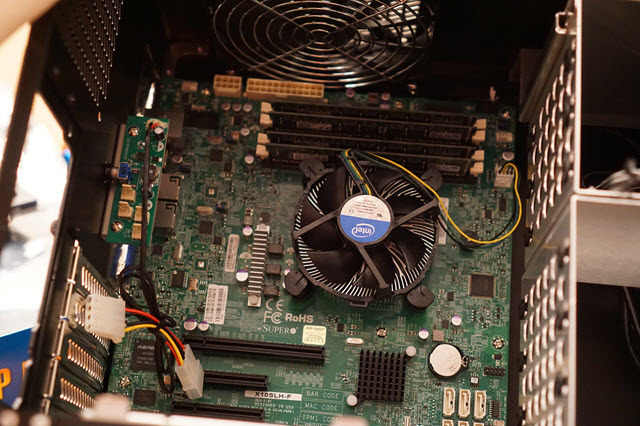 Because the Haswell requires the LGA 1150 socket, the older SuperMicro MBD-X9SCM-F-O board won’t do – it has an LGA 1155 socket (called the Socket H2 for those playing at home). LGA 1150 is the replacement for LGA 1155. I have no desire to deviate from SuperMicro server boards, mainly due to the superb IPMI and remote KVM / media features. These are “must haves” on my home lab list, mainly because I hate crash carts, and IP KVMs for a small environment rarely have remote media at a good price. As such, I would go with the SuperMicro MBD-X10SLH-F-O. 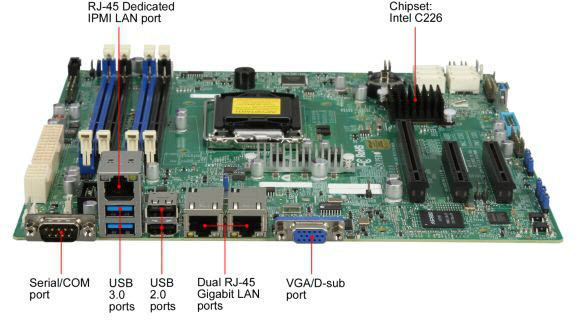 This micro ATX board has all the bells and whistles of the previous board – including IPMI 2.0 with KVM – with an Intel C226 chipset. If the C226 has too many features for your price point, you can drop down to the Intel C222 chipset with the MBD-X10SLL-F-O board. If you are upgrading the guts of an older server running Ivy Bridge or Sandy Bridge, chances are you can re-use your heat sink assembly. The LGA 1150 screw placements are identical to the LGA 1155 screw placements. 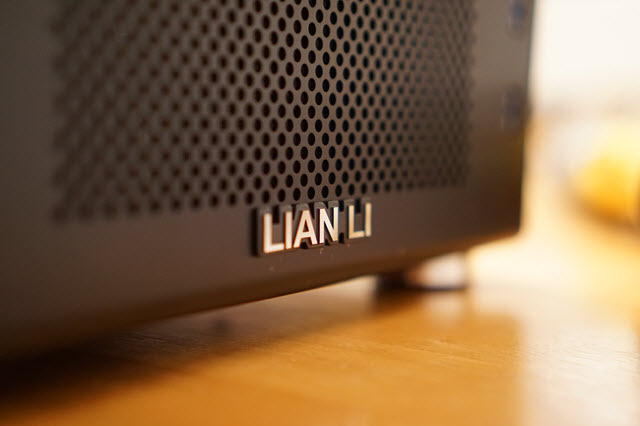 Both boards use the Intel I210-AT LAN chipset, which is supported by VMware. If the hypervisor does not recognize your NICs during installation, create a custom ESXi ISO with the Intel I210 driver package. I suggest using the ESXi-Customizer – it’s awesome! As a bonus – for those looking for a box to run FreeNAS or some other white box storage appliance, the SuperMicro MBD-X10SL7-F-O has a ridiculous amount of device ports. The processor maxes out at 32 GB of ECC Unregistered DIMMs (UDIMMs). The memory type is critical – I saw a ton of comments in my last build post where people bought the wrong memory, so make sure it is Unregistered / Unbuffered (these mean the same thing) and has ECC. Most vendors will call this an ECC UDIMM. Earlier in 2013 I posted an article about upgrading the SuperMicro box to the max amount of memory. 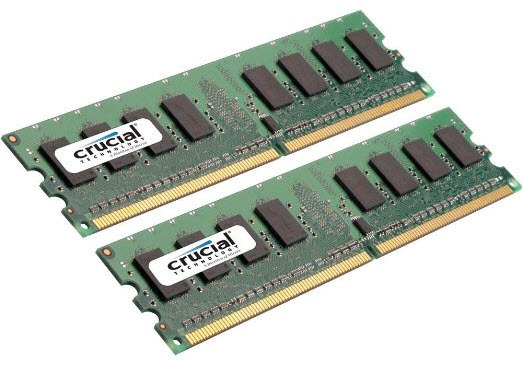 A full set of 4 sticks of 8 GB memory cost about $250 US. Unfortunately, the price of memory has skyrocketed (at the time of this writing) due to disasters at fabrication plants. My advice is to shop around for a great deal on 4 sticks of 8 GB memory (commonly just called 4×8) of ECC UDIMM at 1600 MHz. If you plan on working with VMware VSAN, HP StorVirtual, or any other “disk + flash” storage using local disk, make sure to budget in for some hard drives and SSDs. Also, if you want to play with PernixData FVP or VMware’s vFlash Read Cache (vFRC), you’ll need at least one SSD. I’ve provided links to the two major vendors I purchase from – Amazon and Newegg – along with prices as of December 2013. Keep in mind that these vendors will often choose to change prices for deals at various times, and that rarely can you snag all of the items from a single vendor for the best price. I usually end up grabbing some components from both (or occasionally from a 3rd party). Note: For those using Google Chrome or FireFox, just download the Hover Hound extension. It adds a new button to Newegg that checks prices on Amazon and Tiger Direct. It also shows a trend of prices. The total price for all components: anywhere from $1000 US and up, depending on if you buy all the entire list or shave off a few things. The price of memory is really hurting the server build, so if you can find a good deal on memory – pounce on it! Great review of your lab kit once more! I’ve been looking at new lab kit myself and have been considering E3-1200v3 vs E5-2600v2 processors. Obviously an E5 based machine is going to be more expensive than an E3 based one. However- the really big draw for me is the fact the E5 procs can use more than 32GB of RAM. Looking at some rough costs of 2* E3-1265Lv3 32GB X10SL7-F-0 servers vs 1* E5-2640v2 64GB X9SRH-7F server (same cases and roughly similar cooling components) it seems that the two E3 servers are more expensive. Do you consider 32GB to still be sufficient for a home lab? And within a year or three time? I’ve not considered the cost-benefit of a E3 now and replacing it (probably similar cost) with the “latest and greatest” equivalent in 2 years time. I guess it depends on one’s expected depreciation time frame. With 3x32GB (96GB) of RAM, I’m not memory constrained at this time, and even if I skirt towards it, I can use swap to host cache with an SSD. For me it’s more about making sure I have three hosts (or more) for testing various products and solutions out. I’m also OK with turning off VMs when I don’t need them. You make a good point with the 32 GB of RAM limitation. If I were going to use a single host for my lab and use nested ESXi, I would definitely look at the E5 route. I’m also considering this single host setup for my home lab – E3-1245V3, X10SL7-F, 32GB. Do you think that will be sufficient running a few machines in Hyper-V? Did you finally go for the E3 or the E5? Gotta love artificially inflated price markets. The fire at the Hynix plant was almost exactly 3 months ago, and yet prices continue to rise. Wonder how long we’ll see this stair step price rise before we start to trudge our way back down again. Chris, thanks so much for your writeup! I am using an old white box that I built several years back that could use some updating. Could you expand on your point above about using UDIMM’s? I noticed that the SuperMicro board I was looking at has different memory limitations based on the type of DIMM used. Do you know why this is? Also, why do you recommend using unbuffered DIMM’s rather than the other types of DIMM’s? I can “get by” with 64GB, but if I could use RDIMM’s or LRDIMM’s to get more memory that would be better. Really would like to understand more about this choice. The board you linked uses the LGA 2011 socket, which supports the E5 processor. The E5 can use ECC RDIMMs (Registered DIMMs) and LRDIMMs (Load Reduced DIMMs) which allow for greater capacity. Not all motherboards support this, as ultimately the processor architecture drives memory scale (E5 vs E3). Wow I didn’t know RAM went up so much. Luckily I just did my builds and 32GB was under like $250. I usually go with G.SKILL for all my memory. Only reason I went with Shuttle barebones is I didn’t feel like piecing together a bunch of stuff and they work. Next builds I’ll stick with Supermicro because I want the IPMI features, but I might just buy a Lantronix Spider KVM over IP adapter for now. I am new to esxi (WAF-problems promted me to read up on virtualization), so this might be a dumb question: But when using the SuperMicro MBD-X10SL7-F-O and Intel Xeon E3-1230V3, do I really need to purchase EEC RAM at all? Can’t I go with the cheaper NON-EEC? 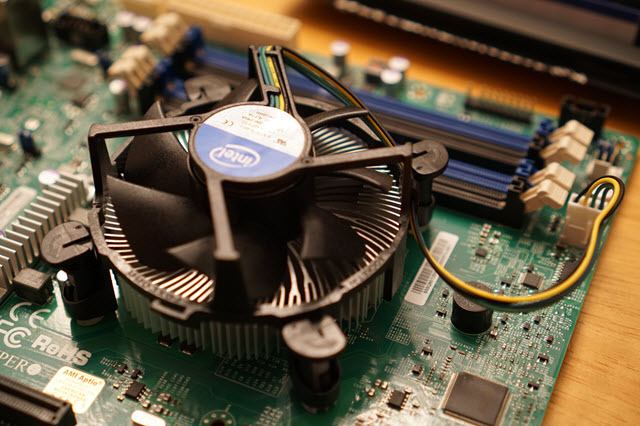 The motherboard requires ECC UDIMMs, regardless of the hypervisor (ESXi). Non ECC memory will not work. 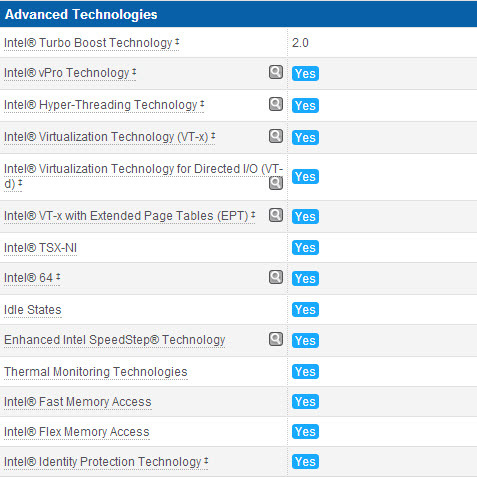 Chris, do you know where I can find what Supermicro Motherboards are listed on the vSphere HCL? I can only find the SM pre-built systems at VMware. Should I just cross reference the components to re-build my home lab? What kind of power consumption would we be looking at for this build? Looks like a fantastic hardware build for a lab. Can I ask how you aquire licensing for the software you plan on running? With the demise of technet, I’m scrambling to find a source for Microsoft licensing so I can continue to keep up with their evolutions of server software. Also, VMware software isn’t cheap so how do you run legit? I’m also not opposed to blowing it all away every three or four months when trials expire – that would keep me fresh, too. Does ESXi 5.5 recognize the onboard RAID of the Supermicro board? I believe it does. If you went with a consumer board it won’t work. That’s why I use my Synology NAS to host the VM’s. The ports are usable for SATA devices, but you will not be able to use the RAID capabilities of the C226/222 for ESXi. I am new to virtualization, and I will risk throwing a dumb questions here, but anywhere I feel lucky to have found a web site like this filled with great information about the white box subject. I discovered the Babydragon’s setup a few months ago when looking for answers about a system that would allow me to start diving into the virtualization world to get certified in the future. I have noticed that with everything here focuses on VMware ESXi, but my question is: what about Hyper-V? Can I feel confident on setting Hyper-V on the white boxes too? Hyper-V you get a little more play when it comes to components. You can either run Hyper-V as a whole or just install Server 2008 R2/Server 2012 and then do the Hyper-V role. I’ve had better lucky getting consumer grade stuff to work in Hyper-V over VMware. I prefer VMware so I built a whitebox with a Shuttle Haswell barebone, i7-4770S, 32GB DDR3 RAM, 256GB SSD (for caching), and a 32GB USB 3.0 drive. It was about like $600-700 for it. I get what you’re saying as this was my initial though on building the whitebox (getting to practice VMWare). But there are implementing Hyper-V on my workplace and I though of getting to know Hyper-V first and then try VMWare latter on the same box. What I am trying to do is putting together a small home-lab that will let me use both “technologies”, in case I need to interchange between the two in a near future. I was also planning on using Hyper-V as the hypervisor. So, I can take from your reply that I can run Hyper-V on the white box? Chris, just following up on your post a while back. I am curious to find out what type of caching you have configured the 256GB SSD drive in your Shuttle i7 VMware ESXi whitebox? Do you have any spinning SATA drives or you connect to a NAS type of external storage box? This build will work with Windows Server and the Hyper-V role. You will want to snag a hard drive to install the OS, instead of a USB stick. Now this comes in very handy as I am about to build a new homelab box. Is it possible to use the internal C226 chipset sata as JBOD in ESXi or are there no drivers available? I assume it’s a fake raid so anyhow there would be no raid possible but if it’s accessible as JBOD it might be a nice testbed for VSAN… Otherwise I might go ahead with an used PERC or Adaptec. Yes, you’ll see a list of vmhba entries representing the SATA controller. Just disable the RAID capabilities and use the disks directly for VSAN (as you already mentioned). I’d agree that the cases are a bit tight if you plan to pop them open frequently. I’ve had to open them twice so far – once to add SSDs for PernixData and again to add my Emulex 10Gb cards – and both times were a pain. But that’s my only gripe. I have built this baby following your blog , pretty awesome ! Any idea where the issue could come from ? I think I found what the issue is . The X10SLL-F use Intel controller Intel I217-LM asides of the Intel AT210 . So far I have been unable to get the NIC that uses the Intel I217-LM working …. If someone has been successful please let me know ! I have one last question . I have a Netgear GS724T that I use for L2 switchng here . I am having big trouble to configure a trunk between my two physical esxi Nic and the Switch . The netgear documentation is very very poor and I am stuck since yesterday . really annoying . Do you know any source of documentation of website where I could have a look to ? Have a nice week end . Can you please take a picture of your mother board, I am having trouble connecting to the right pin outs…its very different from what I am use to and the online manual is not helping me much. My X9SCM ram appears compatible (M391B1G73BH0-CK0) so it would just be a mobo/cpu swap with better pci options and nic chipset. I knew I should have bought more than the 32 gb ram at the time :(. I have some iSCSI datastores and some NFS, but other than passing the eyeball test, I haven’t benchmarked properly. If you have any thoughts, I surely appreciate them. Keep up the great work–love your posts! I haven’t done testing yet either, but I’m running everything via NFS and I’m happy with the performance. I as well run the 1812+ with 2 120GB Samsung 840 for the cache. I did create two iSCSI luns, but haven’t done much with them yet. I put money my performance would be better if I would setup link aggregation, but since the 1812+ only has two NIC’s on it I can’t. I run a NFS share for files and their not apart of the vmdk itself. That’s why I was looking at the DS1813+ because it has 4 NIC’s. I have the 1813+ and I love it! I have two nics setup in link aggregation for my vmware lab and the other two for my home stuff. However, that was on an older DSM and things may have changed. 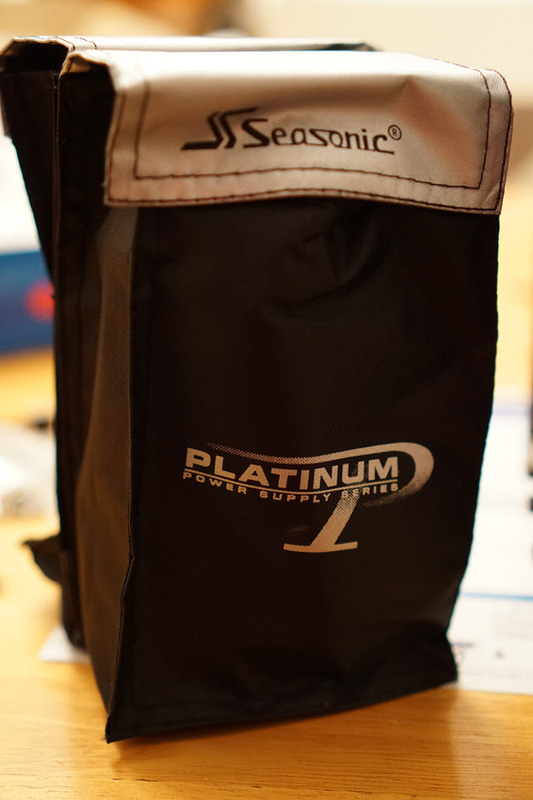 Also, my boxes are the “11” series and the newer 12 & 13 series boxes have numerous hardware improvements. Unless you’re noticing significant latency with iSCSI – which was extremely apparent in my case – you should be fine to choose whichever floats your boat. I want to virtualize my unRAID server on an ESXi host. Is it possible to pass the SATA (or SAS ports when using the X10SL7-F-O) through to the VM? Or would I have to use RDM or something like the IBM ServerRAID M1015 PCI-E card cross-flashed to LSI-9210-8i to be able to pass-through the HDDs? 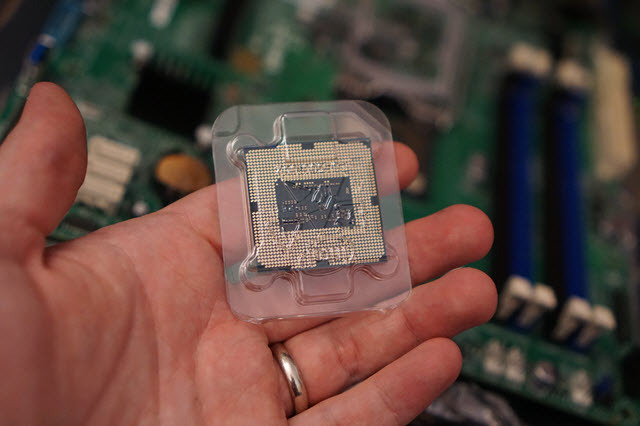 As long as you make sure to snag a processor with Intel VT-d you should be in the clear, although I have only tested this on my slightly older X9SCM board (the Sandy Bridge build). The processor I suggested in this post has VT-d, and is required for VMDirectPath I/O. Make sure to enable the feature on the board BIOS, too. 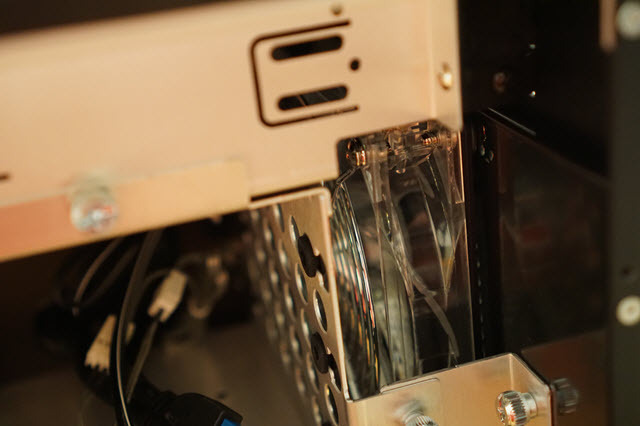 Do you know if it’s possible to pass just some of the SATA ports through on the MBD-X10SLL-F-O? Was hoping I could pass the 4 SATA2 through to a FreeNAS VM. Thanks so much for this article! 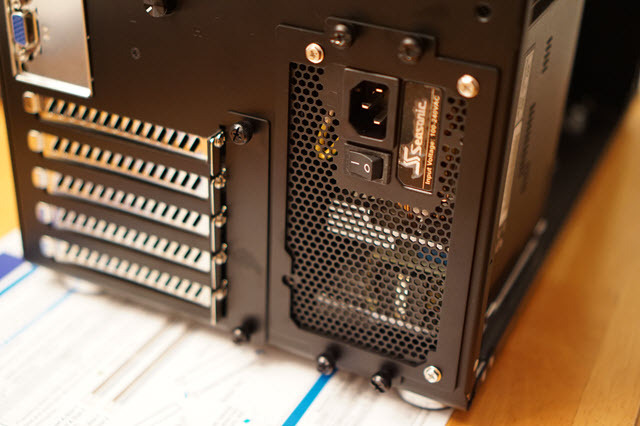 Based on this write-up, I purchased the components you mentioned — the Xeon E3-1230v3, Supermicro X10SLL-F-O, 32G Kingston KVR16E11K4/32, SeaSonic 400W fanless power supply. I installed the CPU and RAM, connected the fan and PSU, and turned on the PSU. So far, so good – solid orange light. Then I shorted the power pins: the CPU fan spun for about half a second, then everything tripped. The orange LED4 light now only “pulses”/blinks – no matter what component is installed or not installed; if I turn on the PSU, it blinks. 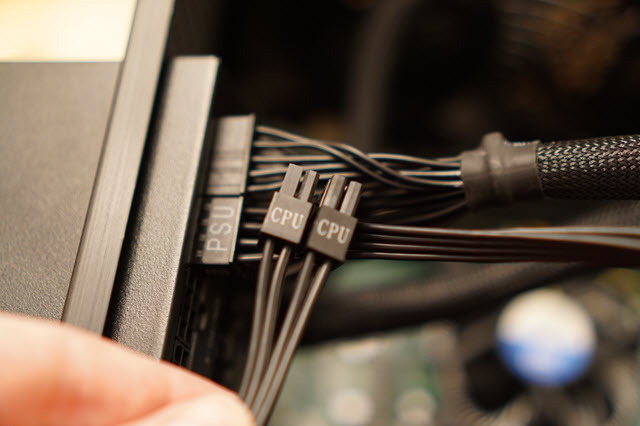 Another PSU produces the same behavior. RMA’d the board, got a replacement — SAME THING! Are there any tricks here? Is the PSU insufficient? 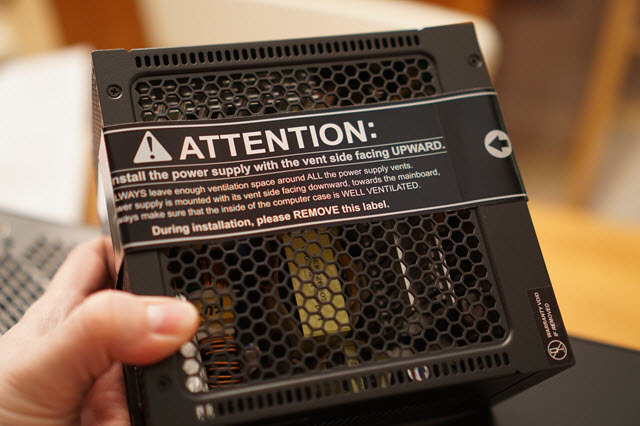 Indeed really weird , especially if you have tried with another brand new PSU . I have built the same box 2 weeks ago and went for a more powerfull PSU (550w). I did not have any issue to build it except with the LAN drivers that I had to tweak a little bit . Did you add other devices to the server that might be consuming additional power – such as hard drives or PCIe devices? If not, I would go through each component to verify it is known working – memory, CPU, etc – and also verify that you have Unregistered ECC memory (UDIMM) and that the mobo fans are plugged into the board (see comment thread from the Sandy build, one guy had an issue around that). Hi Chris – wanted to update. Ultimately, I tried 3 CPUs on 3 different motherboards. Eventually, an RMA return board was good. Either there was a bad batch out of boards out there, or I was really really unlucky. Anyway, I used your parts list and ultimately successfully installed my VM environment/lab. I quickly virtualized a couple of home PCs and my electric bill went down by at least 30 bucks a month! Built a nested environment to do some testing and it worked really well. I use an SSD as the drive for core resources, and added a couple of 1TB drives for testing and non-essential guests. Also installed the VM Replication Appliance and have each machine replicated in at least one additional place for redundancy. For a two cpu or 8 core what would you suggest ? Chris, I built my first ESXi 5.5 lab based off of 1/3 of your equipment above and had a question about video? I want to use multiple displays and had a TRIPLEHEAD2GO Digital graphics adaptor that I attempted to use. It turns out that the on board video in the SUPERMICRO X10SLH-F doesn’t support the 3840×1024 video resolution required. Because I’m just beginning to dive into ESXi 5.5 virtual world I only purchased one complete unit you have listed. My plan is to run ESXi on a Windows 7 64 bit host with VMware Workstation 8 – 10 depending if version 10 gets the bugs out and allows me to use all options that you can run in your lab. How are you and others connecting multiple displaces from a single host? What video card would support 3840×1024 resolution in a lab environment like yours? I use VMware View in the lab to some Windows 7 jump boxes. Sorry! Multiple Displays on a single host? Hey, Chris — this is sort of parallel to this post, but I was wondering if you have any links to good guides on how to get NIC teaming working in ESXi, followed by connecting that teamed NIC to a FreeNAS device running iSCSI/NFS as its storage backend? I’ve been trying to collate various sources together without much luck. Thanks! Hmm. Well, I do cover all of the various ESXi networking bits and pieces in the Networking for VMware Administrators book. But I don’t know much around FreeNAS specifically – you should be able to just provide it a pair of vNICs that are pinned to different uplinks and then use the Linux kernel to create a bond. I would imagine that any FreeBSD guide that covers NIC bonding could help with that part. Depending of your requirements, but normally you wont use more than a single physical link per connection. So you can just use load balancing by NIC-load. This is much more flexible for the nic setup of a vSwitch. because most other functionality works better without nic bonding in my eyes. When you really have the requirement to use more bandwidth than a physical link can handle per connection, then I would do it inside the VM on FreeNAS itself. Don’t have any experience with that, because my FreeNAS VM is just using the vmxnet3 driver with 10G and the rest is distributed by NIC load over the physical links. But as Chris wrote, if it is really required, I would do it on the FreeNAS level. And I bet there must be some guides around. Can’t say much about NFS, but I use iSCSI in a similar setup (ESXi iSCSI (Freenas VM), and iSCSI works like a charm if you set it up as multi-nic. So one portgroup per iSCSI link which results in multiple storage paths. ESXi will automatically distribute the traffic across these links. Has anyone managed to passthrough the SATA controller from the MBD-X10SLH-F-O (C226) as I have recently followed this guide needing full passthrough but apparently the on board SATA controller won’t passthrough to ESXi 5.5. Any help would be greatly appreciated. 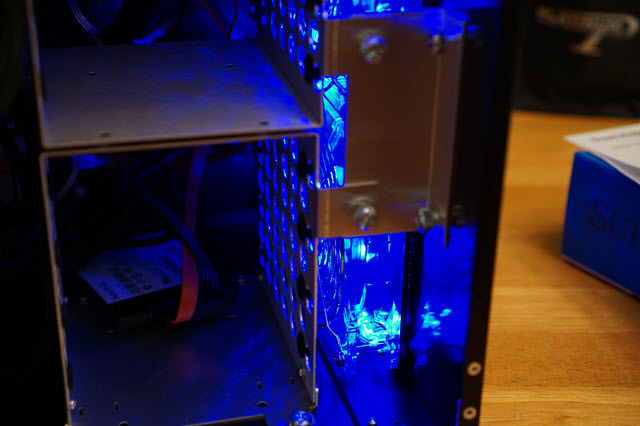 Chris thanks for taking the time to share your experience here and building a home lab. Would like to know if you considered the Supermicro X10SLM+-LN4F. 4 Intel i210AT. The i210AT NICs of my X10SLH-F got recognized with the default 5.5 U1 iso. So don’t know if maybe VMware added the drivers there. But I didn’t try the older iso builds. I also thought about to use this board for my build, but because I had some i340-T4 around I decided to go with them and use the additional PCIE of the X10SLH-F for the card. This results in a total of 6 1Gbit NIC’s (2 onboard and 4 of the i340). First of all, great post, it helped me a lot! Thank you! Everything is running perfectly but I’m struggling with the CPU fan sensor. Every few minutes it alarms because the fan runs below 800 RPMs. Have you experience this issue? Is there a way to fix this, besides running the fans in full speed? Unfortunately I have not run into this issue – perhaps see if you can disable the status monitor feature from the BIOS? Diego, I’ve created three boxes like in Chris’s lab and I don’t have any fan issues either. Try checking the three possibilities below. 1. Did you put a good coat of thermal bond between the fan and CPU? 2. Check to verify you have the fan plugged into the correct fan connector “A”. If you have it plugged into any other fan port #1-3 you might have this issue. Fan port “A” is in the same corner as the six SATA connectors on the motherboard. 3. Could it be a bad fan? Hi Chris, I have a spare PCI-E LSI RAID card that supports 4 hard drives. I was wondering if is better to use the LSI card for RAID 0 instead of the on board RAID? I ordered most stuff from your list, except that I added a water cooling system and different chassis. Yup, I would use your hardware RAID card over the board software RAID. I’ve not tried it myself, but am 99% sure the on board RAID isn’t supported by ESXi. I typically snag a PERC card to overcome this (when required). What PERC raid card do you use? I’m assuming that card is compatible with the system build listed here? None. I don’t use a RAID card in any of my Supermicro servers. oh ok, do you happen to know which ones are supported for this particular MBD-X10SLH-F-O? While your setup is perfect, there is a cheaper way to get nearly the same. The Intel C series (server) are equal to the Q series (desktop), and the Xeon e3 lv3 (server) are equal to the T series i5 and i7 with vPro (desktop). The only downside is that you won’t get ECC, which I don’t care for in a lab, as an upside you’ll get slightly higher turbo clocks. And while you don’t get IPMI (I don’t really like the IPMI of supermicro), the vPro’s have AMT for remote media and KVM. Just ordered everything above. Cant wait to get it here and installed. Thanks for this build/post, it’s extremely helpful. I built a new server based on the specs you provided here and the box works great. I am now looking to add an SATA/SAS HBA that is compatible for passthrough. Any recommendations? My goal is to passthrough a few drives to a freeNAS VM so that FreeNAS has direct access to the drives. I will be doing a software RAID with FreeNAS, not hard RAID. Thanks for any help! I live near a dealer with a bunch of the Dell C1100s. It looks like I can pick those up with dual quads and 32Gb for less than half the price of bulding new. Am I going to be more productive with 2 or 3 physical hosts vs just 1 ? I was going to go external storage so I do not care about local raid ..
Hey Chris, in your experienced view what would be the choice of mobo/cpu bundle to consider for building a ESXi 5 and 6 beta, Are the SuperMicro boards and Xeon CPU’s you have used still capable? I just want to try and future proof my new build, I am intending to move from an old but capable Shuttle i7 2400 based white box with Direct/IO attached SATA/SSD to a FreeNAS VM all running on the same host. I find that SuperMicro and Intel meet my requirements nicely; I have no plans to deviate. It’s more pricey than a desktop-class motherboard, but I value the IPMI, KVM, and remote media features, along with the rock solid performance. AMD seems to be significantly behind Intel from a features and support perspective. In particular this one A1SAI-2750F Atom C2750 Mini-ITX Motherboard, ASRock also have a similar mobo but like you I am also an advocate for SuperMicro who have recently introduced newer boards in this range which I have yet to compare the specs. I know this particular mobo has everything except VT-D (DirectI/O). I am looking to hopefully build 3 hosts for learning about setting up a VSAN cluster which I am sure is going to be the key driver from VMware in ESXi6. What are your thoughts on this new low power architecture and its mini-ITX form factor is what is very appealing for home lab. Anything you would change on the hardware specs based on your experience using over the past year and some of the current options available? Getting ready to build new box for testing. Without writing out everything that has happened, I’ll keep this short. I have updated my bios to version 2.0 successfully. I have tried both installing esxi 5.5 from CD and USB, both of which cause the system to go into a shutdown state during it’s second boot up phase. First phase is the black screen with loading bar at top, second phase is the yellow screen with loading bar at bottom. Throughout all my testing, it has crashed at different parts, but as of right now it gets to “plog loaded successfully” and kind of hangs, then my system makes a click noise like it’s shutting down, monitor goes dark, but fans keep running. I can’t power it off from front power button, keyboard non-responsive, have to yank the power to get it to stop. Maybe a PSU problem somehow? Did you try installing some other OS like Linux? Maybe you can push Debian on it and run stress or prime95 (alternatively you could run it from Ultimate Boot CD or so). Prime95/stress will push your CPU to the limit and therefor consume quite a bit of power through your PSU. Any time I tried to use any USB or SSD storage on this board, esxi installer would crash. I’m now running with a standard SATA HDD and it’s humming along with no issues whatsoever. My assumption is that there must be some additional BIOS setting combinations I need to have in place in order to use USB/SSD but for now, I will just enjoy it as it is. Thank you for the replies and suggestions. Hopefully this info helps the next guy that runs into the same problems. I am a newcomer and will try to build this box before christmas. As I start from zero and have nothing I was wondering if your shopping list is 100%complete: Processor, Motherboard, Memory, USB stick, Case, Fan, Power?? Which Hard drive did you use apart the SSD ones? I did not find any mention of it in your article. @Mario – None. I’m booting ESXi from the USB stick. 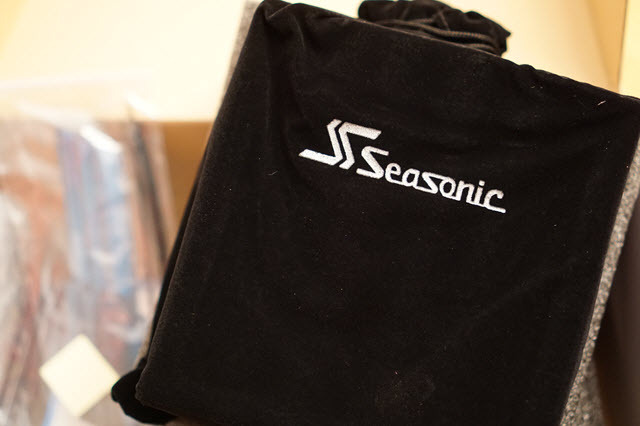 The SSD is used for host caching. can you tell me why the cpu replacement for the new e3-1231v3 ? what are the advantages for this new cpu? The 1231v3 is slightly faster and was released a year after the 1230v3 for the same price. Other than that, the 1230v3 is nearly identical to the 1231v3. Do you happen to have an electronic copy of the “Supermicro MBD-X10SLM-F-B Socket 1150” manual? Supermicro website is broken (ive contacted them). @Pabs – I do not. Thanks Chris. Just building my server based on your spec over the next few days. Appreciate the detailed and accurate post btw. Hi, Really great posts on this topic (Haswell and Sandy Bridge). I’m assembling a similar system inspired by yours – just one node at the moment to test it out using a Supermicro X10SLM+-F. Everything seems to work fine, but I simply can’t get ESXi to work with the IPMI of that board for DPM purposes. Have you tried that? I suspect there is some incompatibility, which is unfortunate, but Googling hasn’t turned up anything. I haven’t used DPM in a long time, but historically it required using Supermicro’s “Dedicated” mode for the IPMI NIC, and making sure the switchport interface was set to auto negotiate. I’ve validated that it works on my Sandy Bridge builds (in the past) but have since removed the dedicated links and now use “Failover” mode, without DPM, to reduce cabling. Good to know that you’ve got it to work in the past. My IPMI is set to dedicated NIC for sure. Regarding the switchport, I assume you mean on the switch? I’ve set that to auto negotiate (speed auto), but still the configuration fails with error “A specified parameter was not correct”. I know the username, password, BMC and MAC are correct, so I’m at a loss to explain what is wrong. I wonder if there is anything you would change if you would build a new home lab today? Great article. Just curious if you do all your hardware monitoring through IPMI? Does the health status page from VMware client show you any details? I’ve read that there is no CIM driver for supermicro motherboards, so I was wondering if VMware was able to read the health information. @Anthony – The short answer is: yes, the hardware status shows for all of the Supermicro servers. I have a more in-depth post covering your comment, cim-ui, IPMI, and example screen grabs that will publish on Mar 16. Have you attempted to create LAG (lacp connection hopefully) with the two onboard GB ports? Played with this at all? I’ve set up a LAG using LACP for demonstration purposes, but it was across 1 on-board port and 1 PCIe NIC port (for redundancy). Using both on-board ports should also work. Hi Chris, I’m not sure if this is still being checked or not, but I enjoyed your build sheet. I was checking the performance on the E3 series processors and they were both out performed by the i7-4790K. Would this provide better performance for a single ESXi 5.5 host? 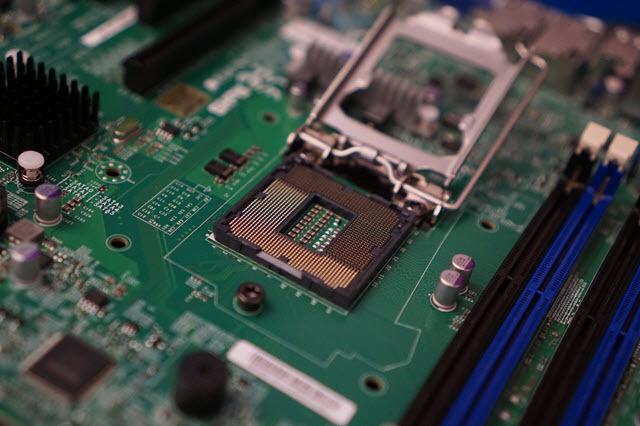 It is a little more expensive than the Xeon processors, but it looks like they will still work with the SuperMicro X10SLH-F-O board you specify above. Will that work or is there a benefit to sticking with the Xeon processor? I will most likely never need more than 32GB RAM for what I need. I’m running an i5-2400K now with 16GB RAM and rarely run into issues, my real issue now is storage and trying to get enough disks. I was going to purchase an ICY device that puts six (6) 2.5″ drives into the 5.25 bay, but I don’t have six SATA 3 connections on my current motherboard. I looked into getting a SATA 3 controller card, but then got concerned with the compatibility with ESXi 5.5 so I looked into the AMD FX-8350 32GB RAM, six SATA3 ports, etc. Nice setup, reasonably affordable, however, it will not run a MAC OS (which I’m interested in learning) so I decided to just stick with Intel. I think I’m overthinking things a bit, but I want to get the best components I can get for the money I’m willing to spend. What do you think? I suppose I can use VMware viewer for the MAC OS or try to install it on another piece of hardware and stick with getting the AMD system, but I’m an Intel guy and it’s very hard for me to pull the trigger on AMD. I also don’t want to spend $1000 on a NAS setup. All of my storage at this time is local to the ESXi box, I have one 2TB, one 1TB and 1 500GB drive all configured as their own datastore. Anyway, any help or push in the right direction would be greatly appreciated. i want to upgrade the memory to 32 g.